Serendipity Reviews: Double Review - The Dahls! Double Review - The Dahls! I am so behind with my reviews, I thought I would double up on this post and write two mini reviews to keep it in the family. I read the following two books back to back and it was nice to read books by both grandfather and granddaughter. Playing With Grownups by Sophie Dahl was released in 2007 and was Dahl's second attempt at fiction. I have always associated Sophie Dahl with modelling for the larger lady, however Dahl has had a complete career makeover. She lost a lot of weight to become a very slim model, before moving into a writing career and recently taking up a cookery career. It seems there are many strings to her bow. Playing with Grownups follows the trials of Kitty as she is brought back to England with a bang when her mother takes a turn for the worse. Heavily pregnant, she boards a plane from America and heads home. Whilst she is travelling, we get glimpses back into her past, where you get to see the relationship between Kitty and her mother. Her mother, Marina, is one of those women who seems afraid of growing old and treats Kitty more like a friend than a daughter. By the end of the book, it is quite obvious that when Kitty reached her teenage years the roles had definitely reversed. Kitty was adult enough to realise that she could no longer live with her mother. This book is described as a sweet coming of age book, but I found it rather bitter sweet. Poor Kitty never really had a proper mother; what she had was a woman, who wasn't quite there and would happily drink and take cocaine in front of her daughter. I did enjoy this book and found it to be a good example of how not to bring up your children. I came away, gently patting myself on my back, realising that although I am not a perfect mother, I am no where near as bad as Marina in this book. The trouble is I know the Marina's of the world do exist and I have met quite a few in the past. It seems such a shame that some children have to feel responsible for their parents. This book is written from the point of view of a girl travelling through the trials of her teens. I loved the character Kitty and felt her pain as she dealt with the devastation her mother caused. I found the book to be well written, however I did get a little confused with the chapters as sometimes the book numbered them and other times it didn't. Sophie Dahl obviously does have a spark of the talent her grandfather had and I look forward to reading more of her books. 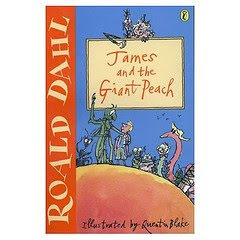 James and The Giant Peach was originally written in 1961 and has gone on to be republished many times over. The children of the world fell in love with Roald Dahl and with every new generation, they fall in love again. I remember growing up and being addicted to Charlie and The Chocolate Factory. I would read this book over and over again, but for some reason I never read any more of his books. After reading James and The Giant Peach, I felt sad that I missed out on so many good books as a child. I endeavour to read them all as an adult. James is sent to live with his two wicked aunts after his parents are eaten by an angry rhinoceros. James is treated badly by his aunts and desperately wants to run away. His luck changes when a mysterious man gives him a bag of magic crocodile tongues which he accidentally drops. Very soon he discovers the giant peach caused by the magic crocodile tongues and manages to make his way inside to meet a lovely array of talking insects who had swallowed some of the magic crocodile tongues. The weight of the peach causes it to break away from the tree and it begins to roll down hill; the adventures of James and the talking insects are about to start. I found this a beautiful, heartwarming book where I could curl right back up into my childhood and savour the words of Dahl and the wonderful pictures by Quentin Blake. Dahl's imagination was outstanding and I can see why the children of today can still fall in love with his books. They are timeless, funny and beautiful and children come out as the heroes of the adventure. A beautiful and entertaining quick read. James and the Giant Peach (and Roald Dahl) have long been family favorites. It sounds like I should consider reading his granddaughter, too! I will have to read James and the Giant Peach because I loved Matilda and I will also read Sophie Dahl. Thanks for your wonderful reviews, Vivienne! I'm not at all familiar with Sophie Dahl and I'm wondering how I could have missed her. I'm going to Google her now. Nowhere near the author that her grandfather was, I confess to not enjoying either of the books written by Miss Dahl. Phoebe is working her way through a Roald Dahl boxset at the moment and loving it. I think she is just starting James and the Giant Peach after just finishing the BFG. I loved this book! Roald Dahl was one of my favourite authors when I was younger. I would like to re-read some of his books sometime and see if I still enjoy them. And after reading your review I'd like to try Sophie's books too. Hi Viv! I loved James and The Giant Peach! I did a Dahl marathon some months ago and read 5 of Dahl's books. They're all very good. I want to read the one by Sophie Dahl some time in the future. I never read James & The Giant Peach. I see so many wonderful reviews of it that it's sad I missed out on it as a kid. But, the Sophie Dahl book sounds just like something I'd really like. And, isn't that a gorgeous book cover! Maybe I'll try Sophie Dahl sometime. James and the Giant Peach is one of my favourites! Have you been to the Roald Dahl Musem and Story Centre? I'm waiting for my boys to be slightly older and until we've read maybe a few of the smaller Roald Dahl books together before taking them. But I want to go just for me too! 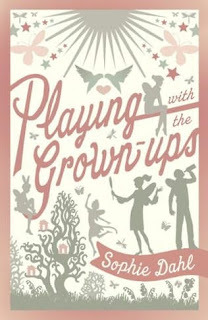 I also read a Sophie/Roald combo for the challenge but, unlike you, I really disliked Sophie Dahl's book! I thought it was very blame-heavy. Sure her mom was awful but she made her own bad decisions and then acted like her mother was the only problem she had. It bothered me! I loved the Roald Dahl memoir I read though. He's wonderful!